CANDLELIGHT RED (@CandlelightRed)–Ryan Hoke (lead vocals), Jeremy Edge (guitars), Jamie Morral (bass) and Brian Dugan (drums)–is ready to reclaim their place in the Active Rock community with the release of their highly anticipated second album, RECLAMATION, which is due out June 4 on Imagen Records. The new album’s first single, “Feel The Same,” will be released to radio May 14. It premiered on Noisecreep.com today and can be heard here: http://aol.it/17IRNRI. RECLAMATION is the follow-up to their 2011 debut album, THE WRECKAGE, which spawned the Active Rock hit, “Closer.” Their DEMONS EP, released in 2012, featured the Top 30 Active Rock single, “Demons.” The new album is a summation of the band’s mixture of hard hitting riffs mixed with melodic songs and heartfelt lyrical content. Sevendust drummer and newly-appointed Imagen Records Vice President of A&R Morgan Rose was brought in to produce DEMONS and the chemistry was evident immediately. Four months later, they teamed up again at The Architekt Studios in Butler, NJ to write and record the new album with the help of mixer/engineer Mike Ferretti. “After recording the EP, I knew the bar would be set very high and I think that we surpassed that with ease,” says Rose. 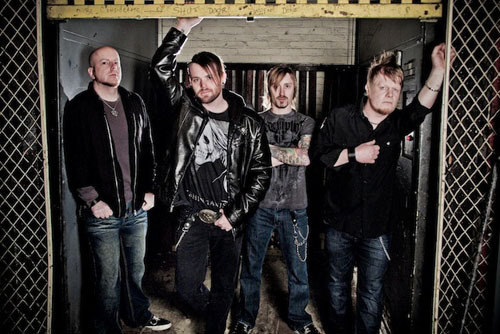 When CANDLELIGHT RED burst onto the scene in 2010, they turned heads right away, especially after beating out over 10,000 other bands to win the 2010 national Guitar Center “Onstage” contest, which landed them an opening slot for KISS. Gene Simmons and Paul Stanley specifically chose the band from among 22 regional contest winners. As a result, the band had the honor of opening for KISS in Pittsburgh in late 2010. In touring news, the band recently wrapped up a tour supporting Sevendust, Coal Chamber and Lacuna Coil and will announce new dates in the coming weeks.